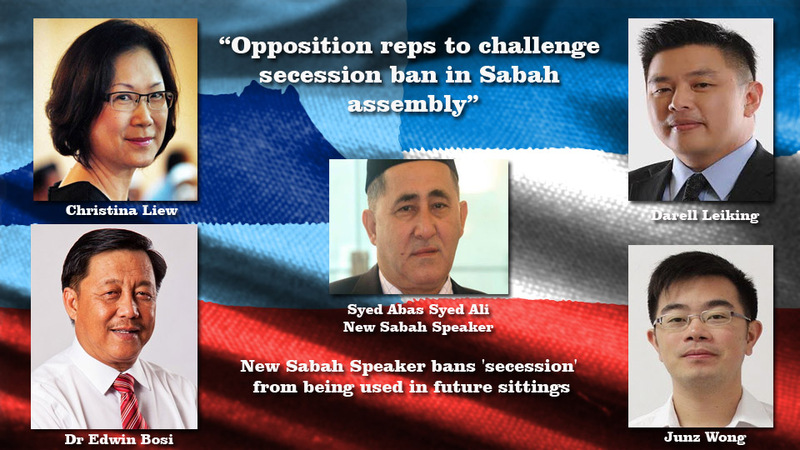 KOTA KINABALU, Aug 12 — Several opposition representatives have deemed as inappropriate and premature the ban on secession talk in the State Assembly, and have pledged to challenge the speaker in the next sitting. Kepayan assemblyman Dr Edwin Bosi said that the speaker has started his first day on the job on the wrong footing by pre-emptively banning the word “secession” before presiding over an actual sitting. “The speaker should decide during the sitting if the word is used, how it is used. Is it unparliamentary? He has to show that it is unparliamentary. “I will challenge him in the coming sitting on this during my speech,” said the DAP secretary to The Malay Mail Online. Api Api elected representative Christina Liew said that the prohibition was premature and that the Speaker should not ban the lawmakers from raising issues from the people. “The speaker must not make such hasty statements. It’s too premature for him to say that. Let’s wait and see as the events turn,” she said. “Since when are the elected representatives forbidden to raise issues concerning the people’s issues in the dewan? The dewan is the place we raise issues concerning the people’s interests and welfare. How can he stop us?” said the PKR Sabah vice-chairman. Sabah legislative assembly Speaker Datuk Syed Abas Syed Ali who clocked in for the first time on Monday, had banned the word “secession” from being uttered during sittings and warned lawmakers against discussing the north Borneo state’s separation from Malaysia. Secession has been a hot topic in the state among politicians, the public and especially on social media since the Facebook group “Sabah Sarawak Keluar Malaysia” gained traction last year. The group, led by UK-based activist Doris Jones, plays on local sentiments by raising issues on native land, oil royalty rights, racial and religious tension and erosion of rights among other things. Secession is considered treason in Malaysia and a warrant of arrest has been issued for Jones. Likas state assemblyman Junz Wong said that the speaker should not hide behind the ban and instead “take the bull by its horns” and delve into the issues surrounding the secession calls in the state. “Talks of secession should not be seen as a threat to leave the federation but Sabah should take the bull by its horns and find out, understand and review the needs of Sabahans, “ he said adding that Sabahans has been feeling marginalised and discriminated by various policies and decisions by both the state and federal government. Calling the ban “unconstitutional,” he urged the government to deal with the issues rather than ignore the sentiments by pushing the blame to “certain quarters” and accused them of politicising the issue. “I challenge the speaker not to ban the word ‘secession’ or ‘secession talks’ in Dewan but instead move a motion to discuss the sentimental issues surrounding the word ‘secession’ ” he said. He said that he would understand banning the usage of profanity during the sitting but words such as “secession” should be used inherently along with “devolution” or “decentralisation” in line with issues related to the development of a country. “So why is the state government so afraid to discuss issues like ‘secession’, ‘devolution’ and hosts of issues agreed to in the Malaysia Agreement 1963? It is a curtailment of our rights, especially the right of the people’s representative to debate for and on behalf of their constituents,” Leiking said.